Author Mary-Lou Meyers is on the left hand (back of cover) with to children looking at a plaque from one of the poems in Mary-Lou’s book. At my 50th college reunion in June I met one of my classmates, Marie-Louise Meyers, for the first time. While Douglass College (part of Rutgers Univ.) was small and my class held less than 400 young women, we were on different learning tracks and our paths never did cross. However, after hearing her poem read on the DVD made especially for our reunion, I knew I wanted to meet her and have her book, Whisperings Along the Octoraro, a river which is in Chester County, PA., not too far from where I now live. The flyleaf of the book notes that the poems take us on a “transformational journey of poetry,” and I must agree. Mary Lou has a way with words. Sometimes the poems are prose-like, sometimes the poetry is like a song, and sometimes the poetry is just beautiful, even if I donâ€™t understand everything in the poem. Mary Lou told me at our interview in Longwood Gardens a few weeks ago that perhaps the poet doesnâ€™t want to explain herself or himself and does not worry whether the reader understands or not. * The poems are akin to an autobigraphy in that they touch on subjects of Mary Louâ€™s childhood, her life on their farm in Chester County, and on the people and animals in her life. Photos of the rural area in which she and her husband Dave lives accompany the poems. In our interview I could see that her passion for poetry is not only genuine, but insistent. She pours her heart out in the lines and we both agreed that compressing our feelings into one or two pages is not easy. But this is her passion, and I am grateful for that need to write down what she feels, expressing herself in ways that we can identify and/or enjoy. She also told me that her poetry kept her sane while battling breast cancer and caring for her aging father. 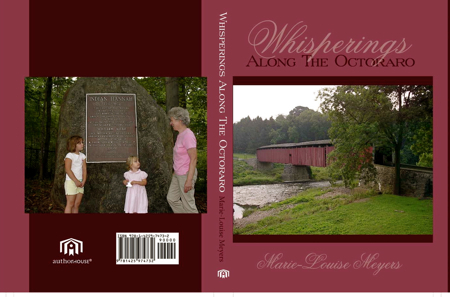 You will want your own copy of Whisperings Along the Octoraro. To do so, go to www.AuthorHouse.com. (The book is available in paperback and hardback.) The bulk of the proceeds benefit of the Oxford (PA) Public Library. And since I love libraries, it is a great way to contribute while enjoying Mary Louâ€™s poetry. so commonplace and yet so rare. no dwarfed portions etched by time. disconnecting the tapestry of life. draining tears through my endless night. P.S. Thanks to Mary Louâ€™s husband Dave for sending me the cover and taking the photos. earlier this week I posted the pickle recipe that David sent me in Kitchen Nutrition. ** The new book will include chapters not only on “Coping,” poems about breast cancer and the treatment, but also dementia and various other disabilities as well as a chapter entitled, “War and Peace,” “Creatures with All the Features,” (conflicts between wildlife and people) “Tell Me a Story,” “Grandma School,” (poems about grandparents and children) as well as “Spiritual Uprising,” elevating the mundane to the Divine. For a poet’s words to live beyond her own time, those words have to be wedded to the natural figures of her natural landscape. I endeavored to do this In Whisperings Along the Octoraro, highlighting both the commonplace and the rare, delivering the “Magic with the Message.” I received a vote of confidence early, after meeting Andrew Wyeth at the Painter’s Crossing Cinema. I followed up with a poem, “On Meeting Face to Face.” He followed up with a brief note ending, “God Bless You,” which was magical to me. We project our own needs into the poem and extract the meaning which is most vital to our own understanding of the world around us and our place in it….Poetry enriches like few other writing. Figurative language gives the poet latitude, which is not possible in prose. Poetry is truth telling with a passion. It’s a way to preserve what we think we might have lost down the road. This is one way to preserve the natural environment as we remember it best. “The World in a Nutshell,” sums up the intensity “how wise to penetrate before you die.” Who else would dare but a poet? Last week in my CSA (Community Supported Agriculture) package was a huge cabbage. I gave half to my neighbor Ofra, since she loves to make salads, and I used the other half. 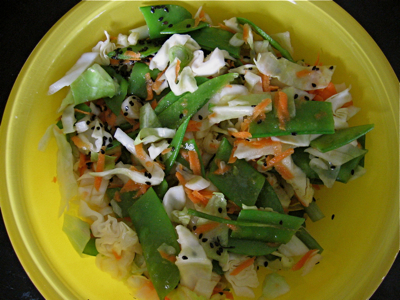 Here is my Asian Cabbage Slaw recipe. (I still have 1/4 cabbage left, so I will see what I can do with that.) I don’t really like mayonnaise, so I usually use some kind of flavored oil, as in this recipe. By pouring boiling water over the cabbage for 5 minutes, it becomes a little less crunchy, but still crisp enough to enjoy almost raw. 1. Bring 3-4 cups water to a boil while preparing cabbage, snow peas, and dressing. Place veggies in a large bowl. 3. In the meantime, grate the carrot and dice the scallions. 4. Drain cabbage and snow peas. Add grated carrot and diced scallions. 6. Chill until ready to serve. You are currently browsing the Menupause weblog archives for July, 2009.